W.W. Norton and Company, 2013. Since the last book I read for this blog delved into Spinoza territory, it seemed appropriate that the next one should highlight Maimonides: the two are opposites in that while Spinoza was famously excommunicated from the Amsterdam Jewish community, Maimonides is so revered that his Thirteen Principles of Faith are lyrics to the yigdal song that is traditionally sung at the end of every Friday night service. Kidding – the books just happened to arrive in that order from the library, but it’s a nice coincidence. I’d been anticipating this latest novel from Dara Horn the same way I looked forward to Jhumpa Lahiri’s book, since I was familiar with her earlier books and loved them. And perhaps this over-anticipation is what led to the bit of the letdown I felt while reading. Don’t get me wrong; it’s still a very good book but it’s not going to be my favorite, and definitely not my favorite Dara Horn book. Part of the reason why recurrent of these images and themes might seem too obvious is the characteristic way that Horn structures her novel. As in her previous books In the Image and The World to Come, Horn creates several parallel stories, in various time periods of history, which eventually all overlap. It’s a neat trick, but I suppose it was much more exciting the first time around. That sounds a lot harsher than I meant – again, it’s still a very enjoyable book. Roughly, the parallel stories follow: 1) Josie and Judith, present-day sisters. Josie and Judith both work in a software program that sounds like Facebook and Instagram times a million; people can digitally archive every moment of their lives or the lives of loved ones; 2) Solomon Schecter (a real person) who, among other famous things, re-discovered the Cairo Genizah which was a treasure trove of Jewish historical records; 3) Moses Maimonides and his brother David (also both real people). My other gripe is admittedly a bit nit-picky, but hear me out. Toward the end of the book, Schecter is reminiscing with his brother about the night the two of them left their small town in Romania for the great wide world. Their father gave both of them a little speech: “ ‘I’ll always remember it,’ Srulik said. ‘It was a grand send-off, a don’t-forget-where-you-came-from sort of thing.’” This imaginary conversation would have been taking place around 1896. I can’t pretend to be an authority on late nineteenth century language, but that long hyphenated descriptor just seemed out of place to me. I think that particular mannerism is a style of our present-day way of speaking, perhaps an indicator of the way we are less facile and less formal (and thus lazier. Instead of taking the time to think of a word that means ‘don’t-forget-where-you-came-from’ we just make one up with hyphens) with language and speaking. So that bothered me as a-historical fiction. The phrase “black fire on white fire” comes from Midrash Tanhuma, Genesis 1 and is a commentary on the line from Deuteronomy 33 about “the fiery law” (the fact that this commentary is filed in the Genesis midrash but is about Deuteronomy is just typical. Midrash is a mixed-up filing cabinet for sure). It bothers me because I don’t see a connection in Horn’s insertion of this phrase and the narrative surrounding it: Schecter isn’t looking at Midrash – and, I don’t know, it just seems like it was put there as a vague reference to “something” that sounded mystical and Jewish, but without full acknowledgment of the origin and meaning of that phrase. And I know Horn knows better, and that she knows her rabbinic literature, because of an absolutely delightful exchange she creates between Schecter and the hilariously corrupt chief rabbi of Egypt. The two engage in a Talmud-quoting war that devolves into made-up quotes: “Where? Shechter thought. His mind reproduced the Hebrew page of the Pentateuch [Torah], locating in his mind’s eye the margin of the page with the medieval scholar Ibn Ezra’s commentary on the text. There was no such hint, of course. The rabbi knew it. They had graduated to fake quotes…the quoting game was much more fun when one wasn’t limited to actual quotes.” I had a rabbinic school professor who used to do this to get our attention, although much more blatantly: he’d paraphrase some sage as saying, “ ‘As the Talmud says, ‘You can do anything you want to do, but uh-uh, don’t step on my cowboy boots’” or some other Hank Williams quote. In most of the book, too, she displays her usual felicity of language, such as describing Josie and Judith’s studious father as “deboning” a book with a multi-colored highlighter pen. Interestingly, Horn also sprinkles in a bit of untranslated Hebrew. It’s just a few sentences of conversation, but it makes me wonder about her intended audience. Do mostly Jews read Dara Horn? Do I find her stories intriguing because the overlapping stories are all about Jewish history or are they good independent of that characteristic? (Probably a bit of both). “ ‘And now he was elected?’ Judith asked. I can appreciate the way Horn brings to life Schecter and Maimonides, and especially the way she describes the drama of Schecter’s re-discovery of the Cairo Genizeh in 1896. But if I were to recommend a book about Schecter and/or the Cairo Genizeh, I think that Adina Hoffman and Peter Cole’s book, Sacred Trash, is excellent (Horn mentions it in the Acknowledgments section) and does a better job telling Schecter’s story. Dave Eggers (http://en.wikipedia.org/wiki/Dave_Eggers )also has a new book, The Circle that examines darker sides of social media and millennial culture. Horn’s book is only partly about this topic, and two books does not a backlash make, but the coincidence of their release is intriguing nonetheless. 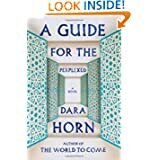 I think a book club can’t really go wrong with a Dara Horn selection, and A Guide for the Perplexed certainly opens up a lot of Jewish topics and presents lively depictions of Jewish historical personalities. But now in this post and the last one I’ve praised certain Nextbook press books, which led me to investigate whether I can order the latest release from the Orlando library. I don’t know if the Orlando Public Library uses any type of digital data gathering on patrons’ online request habits; if so I’m sure I’m pretty easy to pigeonhole so far. • I can get kind of worked up about this because I think it’s happening with more and more frequency in colloquial speech and writing of my own demographic – I mean people using catchy snap phrases or words that they have heard somewhere, whether firsthand on TV or the internet or just as they generally become popular, without understanding their origin. My pet peeve example of this is the word “uber.” I think it’s wildly inappropriate when fellow Jews will describe anything as “uber,” and I’ve even heard an event described (by a Jewish person) as “uber-Jewy.” I just think “uber-Jewy” is but a half step away from “uber-mensch” which was the Nietzschean phrase that inspired Hitler’s Aryan ideal. A less toxic example is “epic fail.” Noun? Adverb? What’s happening? I’m not saying that Horn is being that egregious here (or that I’m not often guilty myself!). It was just an opportunity for a tangential rant. Words matter.